Cinnamon originates from Sri Lanka where it is found in the inner bark of several trees from the genus Cinnamomum, which belong to the family Lauraceae. Cinnamon is harvested between September and November; shoots with finger-thickness and uniform brown colour are ideal for bark extraction. The inner bark is then scraped, peeled and left to dry. This is when it assumes the shape of the quill seen in cinnamon sticks (as shown in the flask on the left in the main picture above). They can also be ground to a powder (as shown in the right hand flask). Cinnamon has been used as a spice throughout history, for a wide range of purposes. Its first use is thought to have been as early as 2000 BC, when it was depicted in paintings found inside Egyptian pyramids. The Egyptians used the spice medicinally as they were aware of its antibacterial and antifungal properties, but also as a flavouring in beverages, and as a perfume in the embalming process, where they would fill body cavities with spiced preservatives. Cinnamon is also mentioned several times in the books of Exodus and Proverbs in the Bible. In Europe’s Middle Ages, cinnamon became a symbol of wealth as Europe and Africa lacked a suitable climate to enable the cultivation of the spice, so it had to be imported from ‘The East’. The cinnamon was transported by long and awkward land routes, limiting supply and making it expensive, which therefore made elevated it to a status symbol. The flavour of cinnamon is due to an aromatic essential oil that makes up 0.5–1 % of its composition. This essential oil is prepared by pounding the cinnamon bark, macerating it in sea water and then distilling it. This leaves an oil, which is golden yellow in colour and has both the odour and taste of cinnamon. The main chemical components of this essential oil are shown in Scheme 1 and include eugenol, a starting point for the synthesis of vanillin, linalool, estragole, ethyl cinnamate, caryophyllene and cinnamaldehyde. These compounds can be separated and identified by solid-phase extraction followed by the use of Gas Chromatography-Mass Spectrometry (GC-MS) [see Box 1]. 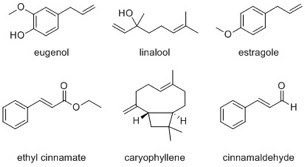 Figure 1: Some of the molecules found in the steam distillate of cinnamon bark. 90 % of cinnamon essential oil is made up of the organic compound 3-phenylprop-2-enal, traditionally called trans-cinnamaldehyde. It is mainly responsible for the distinctive smell and taste of cinnamon. There are several methods of chemical synthesis of this compound, although it remains cheapest to extract cinnamaldehyde by steam distillation of the oil of cinnamon bark. Uses The most familiar application of cinnamaldehyde is as a flavouring in food and beverages, but it also has anti-microbial properties, of interest to a range of industries where it can be used to inhibit the growth of various microorganisms. This, along with its low toxicity, also makes cinnamaldehyde a useful fungicide which has been proven effective on several different crops. Cinnamaldehyde may also have beneficial effects in the treatment of diabetes, although further study appears to be needed in this area. Finally, another interesting application of cinnamaldehyde is that it can be used as a corrosion inhibitor for steel and other ferrous alloys in corrosive fluids. Under high pressure and temperature conditions, the polymerisation of trans-cinnamaldehyde is favoured, which leads to a thin film forming on the metal surface, acting as a barrier to corrosion. The main active ingredient in an ancient spice historically used to spice up foods has an interesting future ahead of it. Gas Chromatography-Mass Spectrometry (GC-MS) GC-MS is an analytical technique that links together gas chromatography and mass spectrometry. Gas chromatography separates a mixture of compounds; it starts after dissolving a sample into a suitable solvent and injecting it into the column. An unreactive gas then carries the sample through the column, where the different compounds travel at different speeds, depending on how well they bind (intermolecular bonding) to the polymer coating inside the column, called the stationary phase; they therefore elute at different times. This approach is similar to paper chromatography familiar to most people, where, in its simplest form, the colours of felt tip pens become separated, and so apparent, when a solvent mixture slowly soaks through some marked filter paper. Here the stationary phase is the filter paper. The compounds eluting from the gas chromatograph are then turned into ions and a mass spectrometer is used to identify each of these substances. Each ion can be identified from its mass, locating the molecular ion peak in the spectrum, but also from the smaller and lighter compounds it breaks into during the procedure. Olivia Levy, at the time of writing, is a final year undergraduate student in the School of Chemistry, University of Bristol, UK. 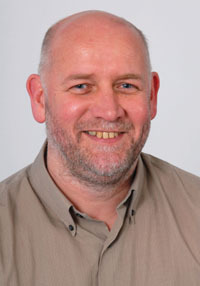 Tim Harrison is the Bristol ChemLabS Director of Outreach, School of Chemistry, University of Bristol, UK. 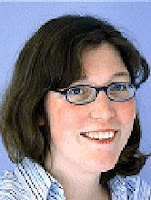 Natalie Fey is a Lecturer based in the Centre for Computational Chemistry, School of Chemistry, University of Bristol, UK. Frascos de fundo redondo, presos firmemente. A canela é originária do Sri Lanka, um país insular asiático no extremo sul do subcontinente indiano. É encontrada na casca interna de várias árvores do gênero Cinnamomum pertencentes à família Lauraceae. A colheita da canela costuma ocorrer entre os meses de setembro e novembro, quando a casca da árvore tem a espessura de um dedo e está uniformemente marrom, ideal para extração. A casca interna é então raspada, retirada do tronco e deixada secar. Depois de seca, a casca se enrola assumindo a forma de um “pergaminho”, o que se conhece como pau de canela (como mostrado no frasco à esquerda na imagem acima). Ela também pode ser moída até virar canela em pó (como mostrado no frasco à direita). A canela tem sido usada como especiaria ao longo da história para uma ampla gama de finalidades. Acredita-se que seu primeiro uso tenha ocorrido por volta de 2000 a.C., conforme retratada em pinturas encontradas dentro de pirâmides egípcias. Os egípcios usavam a especiaria como remédio, pois conheciam suas propriedades antibacterianas e antifúngicas, mas também a usavam como flavorizante para bebidas e como perfume no processo de embalsamamento, enchendo as cavidades do corpo com conservantes aromatizados. A canela também é mencionada várias vezes nos livros de Êxodo e Provérbios da Bíblia. Na Europa, durante a Idade Média, a canela tornou-se um símbolo de riqueza, uma vez que a Europa e a África não apresentavam um clima adequado para permitir o cultivo dessa especiaria, tendo, portanto, que importá-la do Oriente. A canela era transportada por longas e difíceis rotas terrestres, limitando e encarecendo a oferta, elevando-a, assim, a um símbolo de status. O sabor da canela é devido a um óleo essencial aromático que corresponde a 0,5-1% de sua composição. Esse óleo essencial é preparado socando a casca da canela, macerando-a em água do mar e, em seguida, destilando-a. Isto produz um óleo amarelo ouro com o aroma e o sabor característico da canela. Os principais componentes químicos desse óleo essencial são apresentados na Figura 1 e incluem eugenol, um ponto de partida para a síntese de vanilina, linalol, estragol, cinamato de etilo, cariofileno e cinamaldeído. Esses compostos podem ser separados e identificados por extração em fase sólida seguida pelo uso de Cromatografia Gasosa-Espectrometria de Massa (CG-EM) [veja explicação mais adiante]. Figura 1: Algumas das moléculas encontradas no destilado de vapor da casca de canela. O óleo essencial de canela é 90% formado pelo composto orgânico 3-fenilprop-2-enal, tradicionalmente chamado de trans-cinamaldeído. É o principal responsável pelo aroma e o sabor tão marcantes da canela. 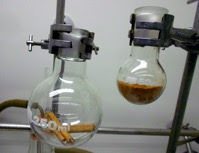 Existem vários métodos de síntese química desse composto, embora ainda seja mais barato extrair cinamaldeído através da destilação a vapor do óleo da casca da canela. A aplicação mais conhecida do cinamaldeído é como flavorizante de alimentos e bebidas, mas também tem propriedades antimicrobianas de interesse para muitas indústrias, podendo ser usado para inibir o crescimento de vários microrganismos. Isto, juntamente com a sua baixa toxicidade, também faz do cinamaldeído um fungicida que tem se mostrado eficaz em diversos tipos de cultivo vegetal. O cinamaldeído também pode ter efeitos benéficos no tratamento da diabetes, embora ainda faltem estudos nessa área. Por fim, outra aplicação interessante do cinamaldeído é como um inibidor de corrosão do aço e outras ligas ferrosas em fluidos corrosivos. Sob condições de alta temperatura e pressão, a polimerização do trans-cinamaldeído é favorecida, o que resulta na formação de uma fina película na superfície do metal, atuando como uma barreira à corrosão. O ingrediente ativo principal de uma antiga especiaria historicamente usada para condimentar alimentos tem um futuro interessante pela frente. A CG-EM é uma técnica analítica que interliga a cromatografia gasosa e a espectrometria de massa. A cromatografia gasosa separa uma mistura de compostos, iniciando-se após a dissolução de uma determinada amostra em um solvente adequado e injetando-a na coluna. Em seguida, um gás não reativo leva a amostra através da coluna, onde os diferentes compostos viajam em velocidades diferentes, dependendo de quão bem eles se ligam (ligação intermolecular) ao revestimento de polímero dentro da coluna, denominada fase estacionária, os quais, consequentemente, eluem em tempos diferentes. Esta abordagem funciona de forma parecida à cromatografia em papel, como muita gente conhece. Por exemplo, em sua forma mais simples, as cores das canetinhas hidrográficas se separam e ficam bem aparentes quando uma mistura de solventes lentamente encharca o papel de filtro marcado com a canetinha. Aqui, a fase estacionária é o papel de filtro. Os compostos eludidos a partir do cromatógrafo de gases são então transformados em íons e um espectrômetro de massa é utilizado para identificar cada uma dessas substâncias. Cada íon pode ser identificado a partir de sua massa, localizando o pico do íon molecular no espectro; mas também pode ser identificado a partir dos compostos menores e mais leves fragmentados durante o procedimento. Livia Levy, na ocasião da escrita deste ensaio, é acadêmica do último ano de graduação na Faculdade de Química da Universidade de Bristol, Reino Unido. Tim Harrison é diretor de atividades de sensibilização do Bristol ChemLabS, Faculdade de Química da Universidade de Bristol, Reino Unido. Natalie Fey é docente efetiva no Centro de Química Computacional da Faculdade de Química da Universidade de Bristol, Reino Unido. Frascos de fondo redondos, fijados firmemente. La canela es originaria del Sri Lanka, un país insular asiático en el extremo sur del subcontinente indiano. En la corteza interna de varios árboles se encuentra el género Cinnamomum perteneciente a la familia Lauraceae. La cosecha de la canela ocurre generalmente entre los meses de setiembre y noviembre, cuando la corteza del árbol tiene la espesura de un dedo y es uniformemente marrón, ideal para la extracción. La corteza interna se raspa, se pela y se deja secar. Después de seca, la corteza se enrolla asumiendo la forma de un ‘pergamino’, lo que se conoce como canela en rama (como se puede ver en el frasco a la izquierda de la imagen arriba). También se puede moler hasta que se convierta en polvo (como se puede ver en el frasco a la derecha). La canela se ha utilizado como especiaría a lo largo de la historia para una amplia gama de propósitos. Se cree que su primer uso ocurrió alrededor de 2000 a.C., según se retrata en pinturas encontradas dentro de pirámides egipcias. Los egipcios usaban la especiaría como remedio, pues conocían sus propiedades antibacterianas y antifúngicas, pero también la usaban como saborizante para bebidas y como perfume en el proceso de embalsamamiento, llenando las cavidades del cuerpo con conservantes aromatizados. La canela también se menciona varias veces en los libros de Éxodo y Proverbios de la Biblia. En Europa, durante la Edad Media, la canela se convirtió en un símbolo de riqueza, ya que Europa y África no tenían un clima adecuado para permitir el cultivo de esta especiaría, por lo que tuvo que importarse del Oriente. La canela era transportada por largas y difíciles rutas terrestres, limitando y haciéndola cara, elevándola así a un símbolo de status. El sabor de la canela se debe a un aceite esencial aromático que corresponde al 0,5-1% de su composición. Este aceite esencial se prepara golpeando la cáscara de la canela, macerándola en agua de mar y luego destilándola. Esto produce un aceite amarillo dorado con el aroma y el sabor característico de la canela. Los componentes químicos principales de este aceite esencial se presentan en la figura 1 e incluyen eugenol, un punto de partida para la síntesis de vainillina, linalol, estragol, cinamato de etilo, cariofileno y cinamaldehído. Estos compuestos pueden ser separados e identificados por extracción en fase sólida seguida del uso de Cromatografía de Gases acoplada a Espectrometría de Masas (GC/MS, por sus siglas en inglés) [ver explicación más adelante]. Figura 1: Algunas de las moléculas encontradas en el destilado del vapor de la cáscara de canela. El 90% del aceite esencial de canela está compuesto por el compuesto orgánico 3-fenilprop-2-enal, tradicionalmente llamado trans-cinamaldehído. Es el principal responsable del aroma y sabor tan marcante de la canela. Existen varios métodos de síntesis química de este compuesto, aunque sigue siendo más barato extraer cinamaldehído por destilación al vapor del aceite de la cáscara de la canela. La aplicación más conocida del cinamaldehído es como saborizante de alimentos y bebidas, pero también tiene propiedades antimicrobianas de interés para muchas industrias, pudiendo ser usado para inhibir el crecimiento de varios microorganismos. Esto, junto a su baja toxicidad, también hace del cinamaldehído un fungicida que se ha mostrado eficaz en diversos tipos de cultivo vegetal. El cinamaldehído también puede tener efectos benéficos en el tratamiento de la diabetes, aunque todavía faltan estudios en esa área. Por último, otra aplicación interesante del cinamaldehído es como un inhibidor de corrosión del acero y otras aleaciones ferrosas en fluidos corrosivos. En condiciones de alta temperatura y presión, la polimerización del trans-cinamaldehído es favorecida, lo que resulta en la formación de una fina película en la superficie del metal, actuando como una barrera a la corrosión. El ingrediente activo principal de una antigua especiaría históricamente usada para condimentar alimentos tiene un futuro interesante por delante. GC-MS es una técnica analítica que conecta la cromatografía de gases y la espectrometría de masas. La cromatografía gaseosa separa una mezcla de compuestos, iniciándose después de la disolución de una determinada muestra en un solvente adecuado e inyectándola en la columna. Entonces un gas no reactivo lleva la muestra a través de la columna, donde los diferentes compuestos viajan a diferentes velocidades; dependiendo de lo bien que se conectan (unión intermolecular) al revestimiento de polímero dentro de la columna, denominada fase estacionaria, los cuales, consecuentemente, aclaran en tiempos diferentes. Este enfoque es similar a la cromatografía en papel, como mucha gente conoce. Por ejemplo, en su forma más simple, los colores de los rotuladores se separan y quedan bien aparentes cuando una mezcla de solventes lentamente llena el papel de filtro marcado. Aquí, la fase estacionaria es el papel de filtro. Los compuestos evadidos del cromatógrafo de gases se transforman entonces en iones y un espectrómetro de masa se utiliza para identificar cada una de estas sustancias. Cada ion se puede identificar a partir de su masa, localizando el pico del ion molecular en el espectro; pero también de los compuestos más pequeños y más livianos en los que se rompe durante el procedimento.